"Two warring families battle for control of the star system. Read the science fiction re-telling of a Sanskrit epic." Every Boentu Leader must first pass through the Proving Ground on Hadad. Alone. When Chran, younger brother of Katha, smuggles his way to Hadad and successfully completes the Proving Ground it creates a break in the line of power that will resonate for generations. Now there are two lines of succession. Two warring families vying for control of the Boentu Star System, but only one can rule. Shatterer of Worlds has not been tagged yet. Help others find Shatterer of Worlds by tagging it! 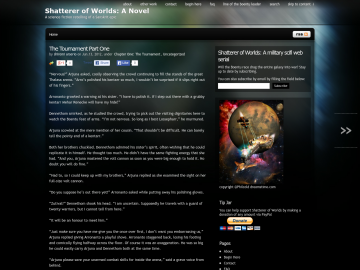 Shatterer of Worlds has not been reviewed yet. Shatterer of Worlds has not been recommended yet.